A career at Innosight is all about the future. You'll learn how to shape a brighter future for companies by helping them grow and innovate. And you'll develop capabilities that will position you for success, no matter what future you choose to create. Our culture is rooted in collaboration, not competition. On every project, we focus on not only meeting the client’s goals, but also ensuring team members realize their personal growth opportunities. By helping one another thrive professionally, we strengthen the firm as a whole. At Innosight, you’ll travel a career path that rewards individual merit above all else. You won’t have to spend a predetermined number of years in a position before earning promotion. If you perform, advancement will follow. Some analysts have been promoted to associate after one year, others after three years. We recognize that people develop at different paces. An analyst is an essential part of the project team at Innosight. Your primary role will be contributing to the team’s problem-solving and communication activities. You’ll also assume full ownership of assigned analyses and workstreams, receiving a moderate level of direction and support while helping teammates address client needs. Get the future in your inbox. An associate has many of the same responsibilities as an analyst, including contributing to the project team’s problem-solving and communication activities. However, you’ll be expected to assume full ownership of workstreams and deliver with minimal direction and support. Working closely with teammates, you’ll also help develop recommendations for the client and sometimes present these findings at client meetings. As a senior associate, you’ll begin to take on a more managerial role. Your main responsibility will be supporting the manager of the project team. In addition, you’ll structure a work plan and storyline around a workstream, including guiding problem solving. A manager is responsible for overseeing a project from start to successful completion. You’ll develop and execute detailed work plans — including leading problem structuring, analysis and problem solving — and manage the day-to-day work of the project team. As a leader in the firm, you’ll manage, help develop and mentor junior consultants while also collaborating with Innosight associate partners and partners on managerial issues. Finally, you’ll have considerable client exposure and lead/facilitate meetings with the client and your team. We’re just as committed to your professional success as you are. That’s why continuous learning and professional development are central to the Innosight experience. Here’s a closer look at learning and professional development at Innosight. Whether you’re brand new to consulting or have several years of experience, you will participate in our new- hire bootcamp. This seven-day learning program (four days for interns) will give you the basic tools you need to start contributing on project teams right away. Bootcamp will enhance your core problem-solving skills and clarify the Innosight approach to pursuing new growth opportunities, building new ventures and capabilities, and accelerating organizational change. You’ll learn by doing, working as part of a team to crack a case modeled on a recent client engagement. Upon joining Innosight, you’ll be assigned a peer mentor and a development leader. Your peer mentor will be a useful resource as you ramp up, helping you navigate the firm and understand your role. Your development leader is the manager or associate partner who will handle your evaluations and serve as a formal advisor on your long-term personal development. Over time, you’ll find that much of the learning here happens on the job. We’ve created a culture where all team members should feel free to request — and offer — real-time feedback on project performance. Also, we encourage you to develop informal mentoring relationships with managers, associate partners and partners. 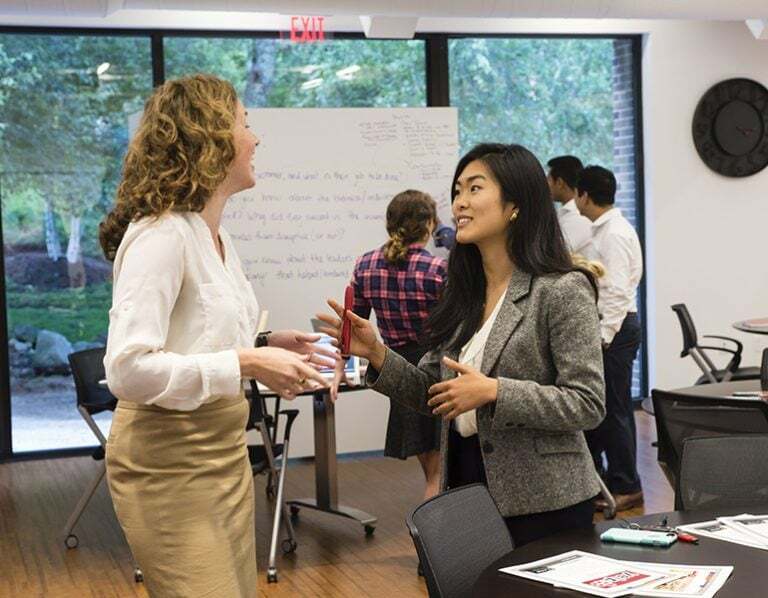 As your career progresses, you’ll participate in a series of professional development programs designed to improve your executive presence along with project management and leadership skills. In addition, we regularly host learning events to bring in outside perspectives to inform and inspire our work. If you have a particular initiative you’d like to explore on your own, you’ll be able to leverage professional development funds to apply toward job-related courses, books and seminars. For consultants who grow into the associate partner and partner roles, we host programs focusing on issues such as business development, client management and firm leadership. We are a growth strategy consulting firm for leaders who aim to design and create the future.